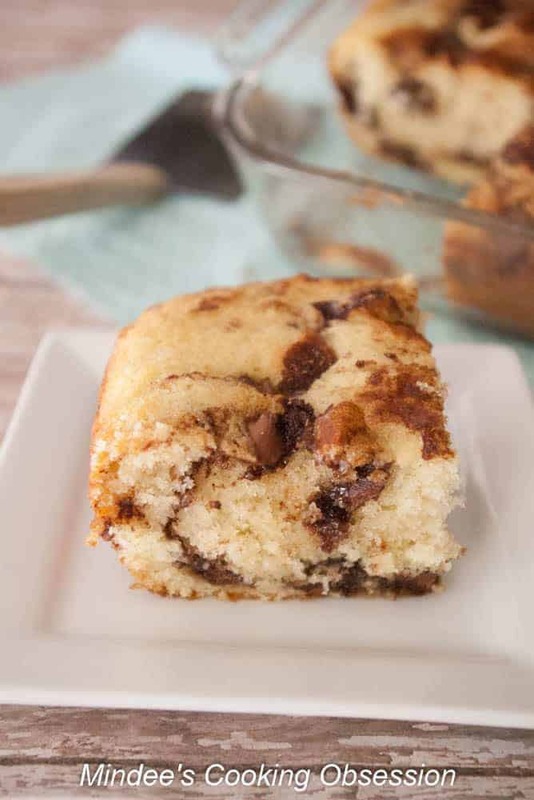 Chocolate chip ripple coffee cake is a moist breakfast cake with just the right amount of chocolate to start your day off on the right foot! I’ve mentioned before we are not really big cereal eaters at my house, so it’s important that I have several quick, well liked breakfast options. 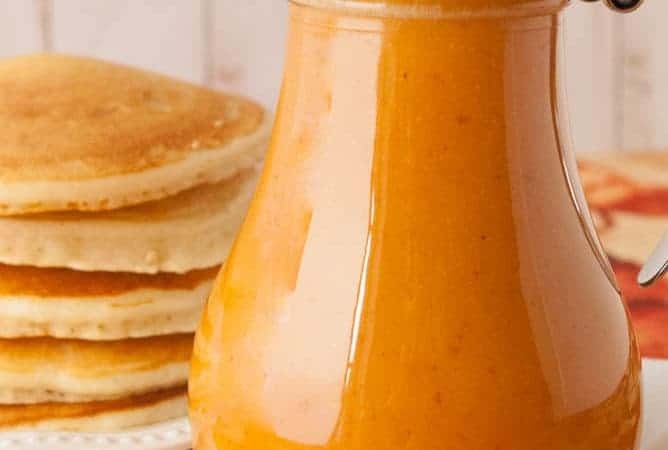 This is a family favorite to eat and one of my favorites to make for breakfast. 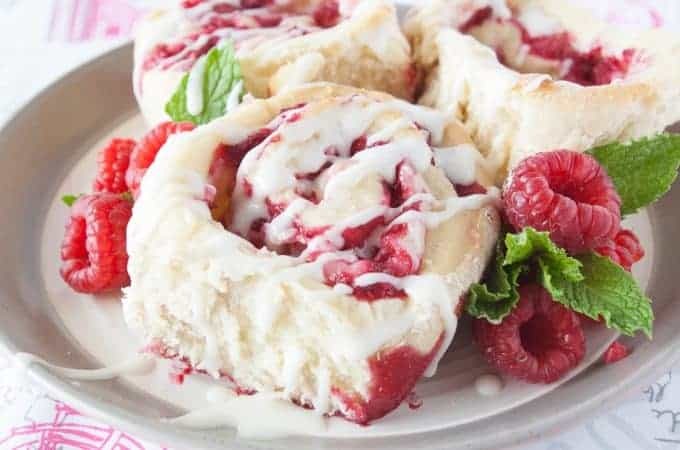 I like that it is quick to make and I like that everyone likes to eat it since I don’t care to start the day listening to complaints about breakfast. 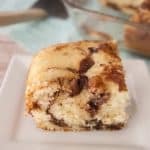 This is a really basic coffee cake with chocolate chips sprinkled in and chocolate swirls of chocolate milk mix powder. Yes, you heard me right, chocolate milk mix powder. Sounds odd, but is totally delicious! 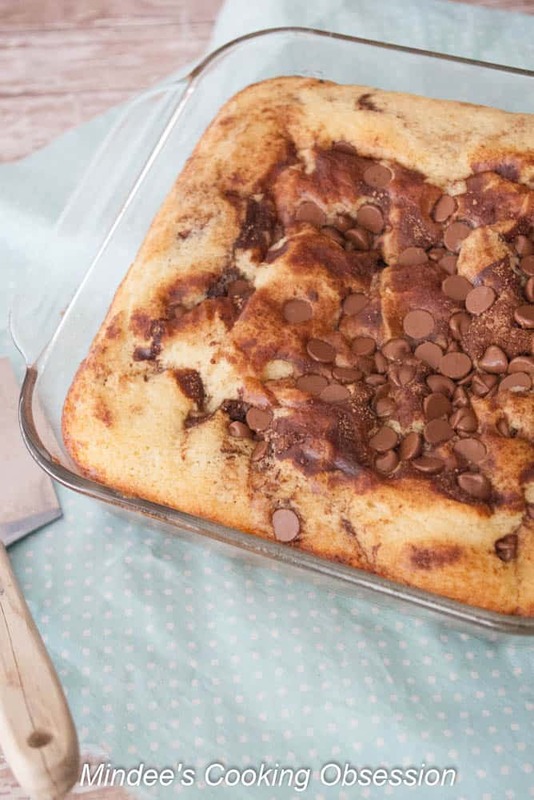 This coffee cake batter is really simple. After you have made the batter. Spread half of it into a prepared 8×8 baking dish. Sprinkle a tablespoon of chocolate milk mix powder over the batter and sprinkle with chocolate chips. Then carefully spread the remaining batter over the top and sprinkle another tablespoon of chocolate milk mix powder and some chocolate chips over the top. Don’t worry if it’s not perfect. Just do your best. Bake for 35 minutes or until a toothpick comes out clean and the top is lightly golden brown. Serve warm. Preheat the oven to 350 degrees. Spray an 8 x 8 baking dish with non-stick cooking spray. Add the salt and baking powder. Mix well. Add 1/2 cup of the flour and once it is incorporated add 1/3 cup milk. Once the milk is incorporated add another 1/2 cup flour, then the remaining 1/3 cup of milk, followed by the remaining 1/2 cup flour. Spread 1/2 the batter in the prepared baking dish. Sprinkle with 1 to 1 1/2 Tbs chocolate milk mix powder and 1/2 cup chocolate chips. Carefully spread the remaining batter over the top and sprinkle with another 1 to 1 1/2 Tbs chocolate milk mix powder and remaining 1/2 cup chocolate chips. Bake at 350 degrees for 30-35 minutes or until a toothpick comes out clean and the top is lightly golden brown.